Charoset (or Haroset) is one of those obscure Jewish foods, prepared and eaten only once a year in Passover (mostly just during the Seder), and unlike the beloved Matzoh ball, it is hardly known to non-Jews. When I first saw it as a child I was neither particularly enticed by its appearance, nor seduced by the sounds of its name (which sounds like a disease). To make matters worse, it is eaten during the Seder wrapped in an odd looking "sandwich" along with horseradish (Hazeret in Hebrew) - which is also the name for mumps, not to mention a true tear-jerker and a traumatic experience for a child of any age *. The most common knowledge for the reason behind eating Charoset is it is representative of the mortar that our enslaved ancestors had to mix by the tonnes in Egypt. Other sages say that the Charoset is a remnant of the Paschal lamb - the sacrifice that commemorates the lamb that was slaughtered in each Jewish household in Egypt on the night of the tenth plague: the killing of the first-born. A bundle of hyssop was dipped in this poor lamb’s blood, and smeared on the door frames, as a sign for the Angel of Death to skip the Hebrew homes and spare the lives of our first-born. Hillel’s Sandwich (which I mentioned earlier) alludes to that symbolism of Charoset, as it represents eating the Paschal Lamb with the Matzoh and the Maror (bitter herbs), as directed in the Torah (Exodus 12:8). Other sages and rabbis say that Cahroset needs to include all the fruit mentioned in Song of Songs (AKA Song of Solomon or Canticles). This poetic book signifies the unique relationship between God and his chosen people, which is read during Passover, the holiday that signifies the point in history as the birth of the Israelites as a nation. Among the fruit mentioned are apples, pomegranates, dates, figs and nuts. The spices added to the mixture (typically speaking: cinnamon and ginger) represent the pieces of straw that were added to strengthen the mortar. Now, Charoset greatly varies between different Ashkenazi and Sephardi Jews. Generally speaking, Ashkenazi Charoset is apple based (occasionally with pears added) and has a consistency of a dip or a spread; while Sephardi Charoset is more date-dominant, and often is formed into balls. And even within these two major ethnic groups, there are many different traditions and recipes vary greatly, for instance: Babylonian Charoset is made from Silan (date molasses) thickened with ground almonds, and I even came across a Moroccan recipe that is a paste of chestnuts, almonds and walnuts spiced with cinnamon and cloves; and some Ashkenazi recipes include raisins, while others use sugar as a sweetener; some call for pears in addition to the apples, and may use additional spices besides the cinnamon (i.e. : nutmeg, cloves, etc.). The Jews of Rome (and Italy) seem to have a balanced mixture of both, as you will soon see in the recipe I’ve received from my Italian sister in law, which was passed on to her from her great-great-grandmother, Nona Silvia Bassano from Livorno, Italy; yet surprisingly does not include any wine - an ingredient that so far has been consistently appeared in all the Charoset recipes I've researched. 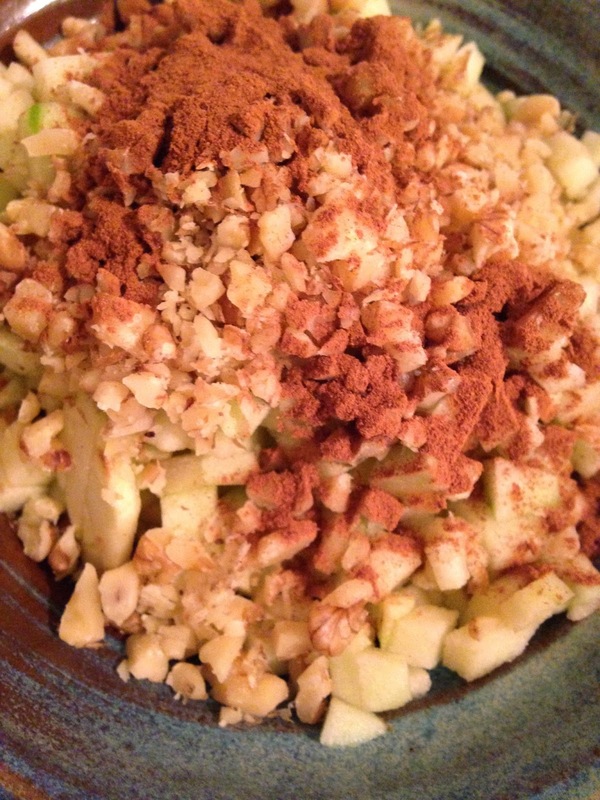 Some say that the use of fruit that brown overtime is the key for making a proper, mortar-looking Charoset. Hence using apples and pears without any lemon juice to avoid oxidation. The Jews of California have taken this one step further by making Charoset with bananas and avocados as well. I cringe to the idea of how this would look like the next day - kinda like leftovers of a smoothie, which I am sure is not a rare sight in raw-food-loving SoCal. I have to make a little confession: as much as I love my grandmother’s Ashkenazi Charoset, I was never able to replicate it satisfactorily in my own kitchen and have given up many years ago on trying it again. But someone asked me about Charoset and I got intrigued and looked it up in my library of cookbooks. Once I read about the Song of Songs reference to Charoset (in Phyllis and Miriyam Glazer’s “The Essential Book of Jewish Festival Cooking”), my imagination was immediately ignited, and I had to try both recipes in their book: a Yemeni Charoset and an Ashkenazi Charoset, that was very similar to my grandmother’s, except that it called for chopping the apples rather than grating them. Chop the apples into tiny cubes (almost minced), or use the coarse side of a grater if you prefer a more watery consistency. Chop the soaked raisins. Finely mince the walnuts and add to the apples. Add the cinnamon and sugar. Keep refrigerated and use within 3-4 days. Can be enjoyed out of the Seder ceremony throughout the Passover week. I love it with Matzoh brei or on a potato kugel. Boil the water and sugar to make a syrup. Add the almonds and continue cooking. Add the grated apples, and continue cooking, stirring constantly to prevent sticking to the bottom of the pot. If too watery - continue cooking for more reduction; if too dry, add a little more water. Add the cinnamon, and cook until the mixture starts bubbling and puffing. * If your parents are of the merciful type, they'll make this very sandwich with lettuce, which is a peculiarly delicious affair, and one of the significant flavours that makes this holiday forever memorable on every person's palate. ** Optional - if you eat Kitniyot on Passover). I personally found their texture in this context to be annoying, as well as the fig seeds. 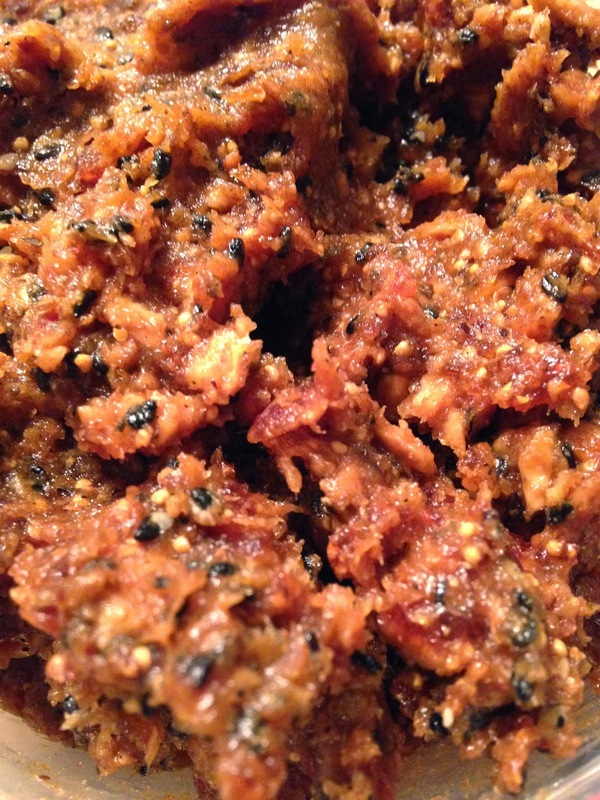 Next time I am trying this with less figs, more dates and with tahini (sesame paste) instead! *** For a more Yemeni-style Charoset, you may add some ground cloves and cardamom, to taste.